My love for romcoms is fierce, which is why I’ve been looking for more movies like Rules Don’t Apply. This movie proves that love indeed can overcome all obstacles. Love the feeling of being in love, in both good times and in hard times? Check out these movies like Rules Don’t Apply! Rules Don’t Apply is an upcoming movie that features romance, comedy, and drama. It is due to hit theaters on November 23, 2016. The movie takes place during the 1950’s in Hollywood and showcases the love story of Marla Mabrey and Frank Forbes. The two experience an instant connection but not only do they have different religious backgrounds, but their employer Howard Hughes, does not allow relationships between those who work for him. 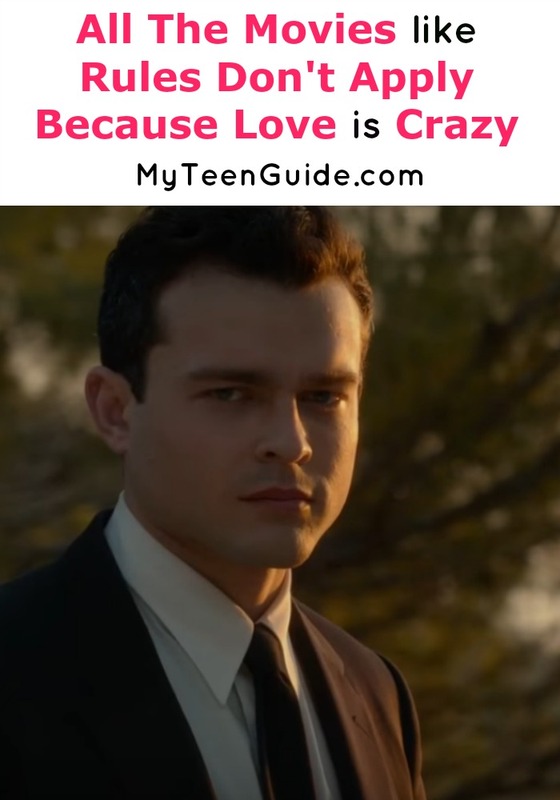 Rules Don’t Apply stars Lily Collins as Marla, Alden Ehrenreich as Frank and Warren Beatty as Howard. Here are some movies that are similar. Enough Said is a 2013 romantic comedy-drama movie that features the romance between Eva, a divorced masseuse and Albert, the ex-husband of her client/friend Marianne. Enough Said stars Julia Louis-Dreyfus as Eva, James Gandolfini as Albert and Catherine Keener as Marianne. Crazy, Stupid, Love is a 2011 romantic comedy movie about the life of Cal Weaver, a middle-aged man in the midst of a divorce from his wife, Emily, after she has an affair with her co-worker David Lindhagen. At a bar one night, Cal becomes friends with Jacob Palmer, who teacher Cal how to pick up women. Crazy, Stupid, Love stars Steve Carell as Cal, Julianne Moore as Emily, Kevin Bacon as David and Ryan Gosling as Jacob. Knight of Cups is a 2015 experimental drama movie that tells the story of Rick, a depressed screenwriter who is in search of love and discovers some colorful figures that are identified by tarot cards. The movie is divided into 8 chapters that are each named after a tarot card and describe Rick’s relationship with a person in his life. Knight of Cups stars Christian Bale as Rick. The Age of Adaline is a 2015 romantic fantasy movie that showcases the life of Adaline Bowman, who stopped aging at the age of 29, after a strange car accident. She lives a solitary life until she meets Ellis Jones, who complicates her life in ways she could have never imagined. The Age of Adaline stars Blake Lively as Adaline and Michiel Huisman as Ellis. Silver Linings Playbook is a 2012 romantic comedy-drama movie that is based on the 2008 book of the same name by Matthew Quick. The movie is about Pat Solitano, a former teacher who was recently released from a mental health facility for bipolar disorder treatment. His main goal is to win back the love of his estranged wife, who currently has a restraining order against him. Pat meets Tiffany Maxwell, a depressed widow who agrees to help Pat win back his wife as long as he becomes her partner in a dance competition. Silver Linings Playbook stars Bradley Cooper as Pat and Jennifer Lawrence as Tiffany. So have you seen any of these movies like Rules Don’t Apply? Enough Said was perfect for date night! Which movie would you watch first?